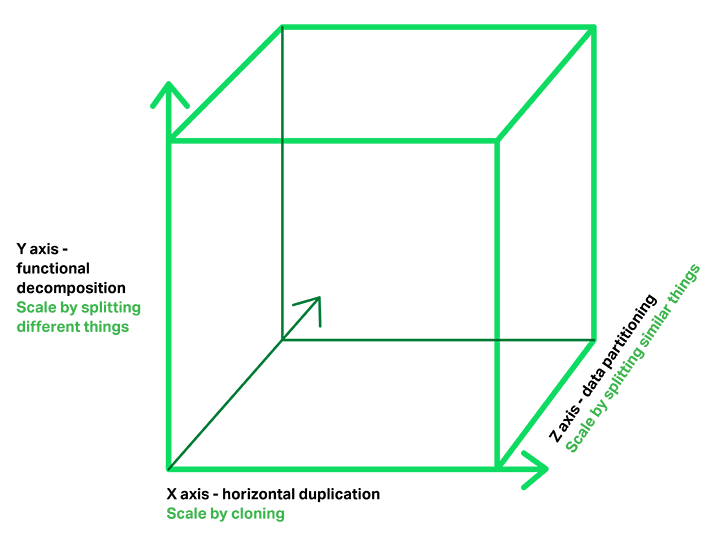 We will go for a while thinking out of SharePoint and .Net solutions. This guest post by Chris Richardson, founder of original CloudFoundry.com is very impressive and could not resist sharing on adicodes.com. About Chris Richardson: Chris is the founder of the original CloudFoundry.com, an early Java PaaS (Platform-as-a-Service) for Amazon EC2. He now consults with organizations to improve how they develop and deploy applications. He also blogs regularly about microservices at http://microservices.io. Microservices are currently getting a lot of attention: articles, blogs, discussions on social media, and conference presentations. They are rapidly heading towards the peak of inflated expectations on the Gartner Hype cycle. At the same time, there are skeptics in the software community who dismiss microservices as nothing new. Naysayers claim that the idea is just a rebranding of SOA. However, despite both the hype and the skepticism, the Microservice architecture patternhas significant benefits – especially when it comes to enabling the agile development and delivery of complex enterprise applications. This blog post is the first in a 7-part series about designing, building, and deploying microservices. You will learn about the approach and how it compares to the more traditional Monolithic architecture pattern. This series will describe the various elements of the Microservice architecture. You will learn about the benefits and drawbacks of the Microservice architecture pattern, whether it makes sense for your project, and how to apply it. Applications written in this style are extremely common. They are simple to develop since our IDEs and other tools are focused on building a single application. These kinds of applications are also simple to test. You can implement end-to-end testing by simply launching the application and testing the UI with Selenium. Monolithic applications are also simple to deploy. You just have to copy the packaged application to a server. 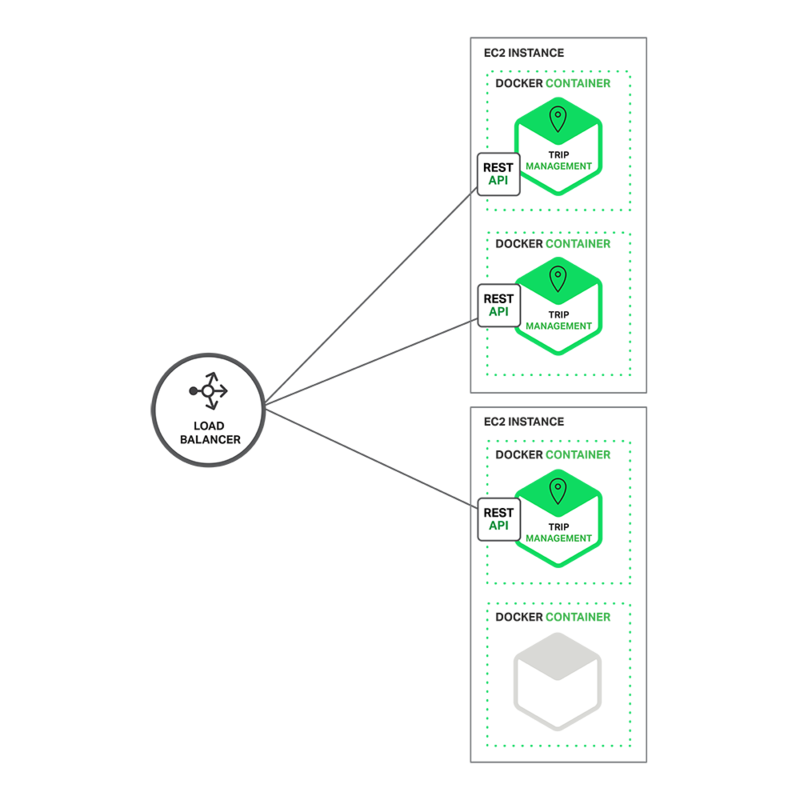 You can also scale the application by running multiple copies behind a load balancer. In the early stages of the project it works well. Unfortunately, this simple approach has a huge limitation. Successful applications have a habit of growing over time and eventually becoming huge. During each sprint, your development team implements a few more stories, which, of course, means adding many lines of code. After a few years, your small, simple application will have grown into amonstrous monolith. To give an extreme example, I recently spoke to a developer who was writing a tool to analyze the dependencies between the thousands of JARs in their multi-million line of code (LOC) application. I’m sure it took the concerted effort of a large number of developers over many years to create such a beast. The sheer size of the application will also slow down development. The larger the application, the longer the start-up time is. For example, in a recent survey some developers reported start-up times as long as 12 minutes. I’ve also heard anecdotes of applications taking as long as 40 minutes to start up. If developers regularly have to restart the application server, then a large part of their day will be spent waiting around and their productivity will suffer. Monolithic applications can also be difficult to scale when different modules have conflicting resource requirements. For example, one module might implement CPU-intensive image processing logic and would ideally be deployed in AWSEC2 Compute Optimized instances. Another module might be an in-memory database and best suited forEC2 Memory-optimized instances. However, because these modules are deployed together you have to compromise on the choice of hardware. Many organizations, such as Amazon, eBay, and Netflix, have solved this problem by adopting what is now known as theMicroservice architecture pattern. Instead of building a single monstrous, monolithic application, the idea is to split your application into set of smaller, interconnected services. 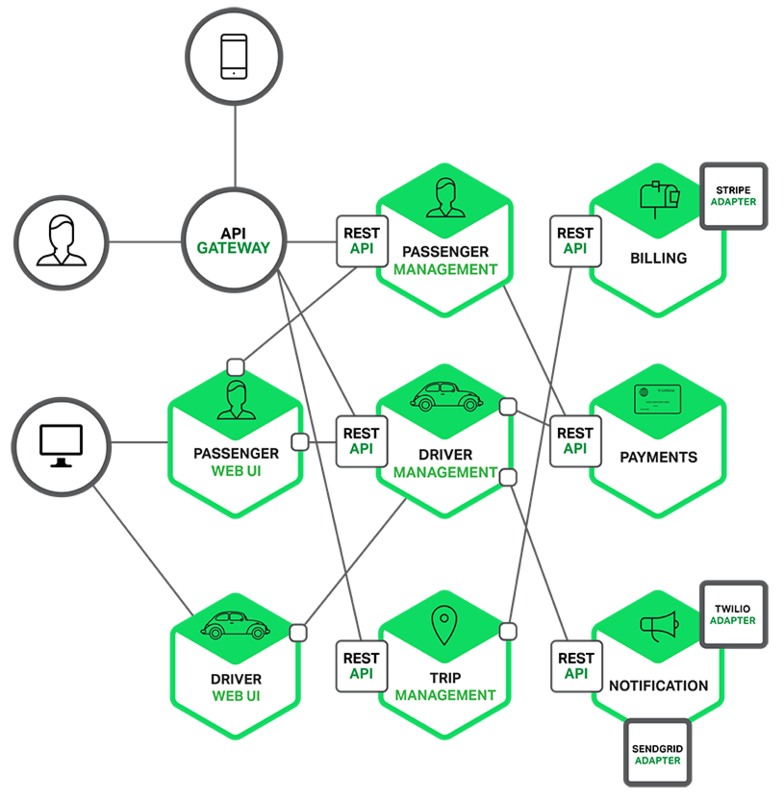 Each back-end service exposes a REST API and most services consume APIs provided by other services. For example, Driver Management uses the Notification server to tell an available driver about a potential trip. The UI services invoke the other services in order to render web pages. Services might also use asynchronous, message-based communication. Inter-service communication will be covered in more detail later in this series. The Microservice architecture pattern corresponds to the Y-axis scaling of the Scale Cube, which is a 3D model of scalability from the excellent book The Art of Scalability. The other two scaling axes are X-axis scaling, which consists of running multiple identical copies of the application behind a load balancer, and Z-axis scaling (or data partitioning), where an attribute of the request (for example, the primary key of a row or identity of a customer) is used to route the request to a particular server. Applications typically use the three types of scaling together. Y-axis scaling decomposes the application into microservices as shown above in the first figure in this section. At runtime, X-axis scaling runs multiple instances of each service behind a load balancer for throughput and availability. Some applications might also use Z-axis scaling to partition the services. The following diagram shows how the Trip Management service might be deployed with Docker running on AWS EC2. The Microservice architecture pattern significantly impacts the relationship between the application and the database. Rather than sharing a single database schema with other services, each service has its own database schema. On the one hand, this approach is at odds with the idea of an enterprise-wide data model. Also, it often results in duplication of some data. However, having a database schema per service is essential if you want to benefit from microservices, because it ensures loose coupling. The following diagram shows the database architecture for the example application. On the surface, the Microservice architecture pattern is similar to SOA. With both approaches, the architecture consists of a set of services. However, one way to think about the Microservice architecture pattern is that it’s SOA without the commercialization and perceived baggage of web service specifications (WS-) and an Enterprise Service Bus (ESB). Microservice-based applications favor simpler, lightweight protocols such as REST, rather than WS-. They also very much avoid using ESBs and instead implement ESB-like functionality in the microservices themselves. The Microservice architecture pattern also rejects other parts of SOA, such as the concept of a canonical schema. The Microservice architecture pattern has a number of important benefits. First, it tackles the problem of complexity. It decomposes what would otherwise be a monstrous monolithic application into a set of services. While the total amount of functionality is unchanged, the application has been broken up into manageable chunks or services. Each service has a well-defined boundary in the form of an RPC- or message-driven API. The Microservice architecture pattern enforces a level of modularity that in practice is extremely difficult to achieve with a monolithic code base. Consequently, individual services are much faster to develop, and much easier to understand and maintain. Third, the Microservice architecture pattern enables each microservice to be deployed independently. Developers never need to coordinate the deployment of changes that are local to their service. These kinds of changes can be deployed as soon as they have been tested. The UI team can, for example, perform A|B testing and rapidly iterate on UI changes. The Microservice architecture pattern makes continuous deployment possible. Finally, the Microservice architecture pattern enables each service to be scaled independently. You can deploy just the number of instances of each service that satisfy its capacity and availability constraints. Moreover, you can use the hardware that best matches a service’s resource requirements. For example, you can deploy a CPU-intensive image processing service on EC2 Compute Optimized instances and deploy an in-memory database service on EC2Memory-optimized instances. As Fred Brooks wrote almost 30 years ago, there are no silver bullets. Like every other technology, the Microservice architecture has drawbacks. One drawback is the name itself. The term microservice places excessive emphasis on service size. In fact, there are some developers who advocate for building extremely fine-grained 10-100 LOC services. While small services are preferable, it’s important to remember that they are a means to an end and not the primary goal. The goal of microservices is to sufficiently decompose the application in order to facilitate agile application development and deployment. Another challenge with microservices is the partitioned database architecture. Business transactions that update multiple business entities are fairly common. These kinds of transactions are trivial to implement in a monolithic application because there is a single database. 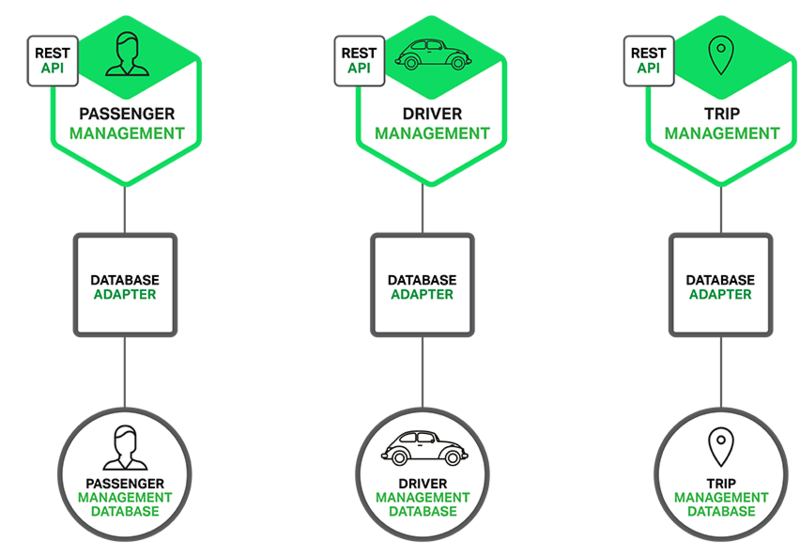 In a microservices-based application, however, you need to update multiple databases owned by different services. Using distributed transactions is usually not an option, and not only because of theCAP theorem. They simply are not supported by many of today’s highly scalable NoSQL databases and messaging brokers. You end up having to use an eventual consistency based approach, which is more challenging for developers. Another major challenge with the Microservice architecture pattern is implementing changes that span multiple services. For example, let’s imagine that you are implementing a story that requires changes to services A, B, and C, where A depends upon B and B depends upon C. In a monolithic application you could simply change the corresponding modules, integrate the changes, and deploy them in one go. In contrast, in a Microservice architecture pattern you need to carefully plan and coordinate the rollout of changes to each of the services. For example, you would need to update service C, followed by service B, and then finally service A. Fortunately, most changes typically impact only one service and multi-service changes that require coordination are relatively rare. One approach to automation is to use an off-the-shelf PaaS such as Cloud Foundry. A PaaS provides developers with an easy way to deploy and manage their microservices. It insulates them from concerns such as procuring and configuring IT resources. At the same time, the systems and network professionals who configure the PaaS can ensure compliance with best practices and with company policies. Another way to automate the deployment of microservices is to develop what is essentially your own PaaS. One typical starting point is to use a clustering solution, such as Mesos or Kubernetes in conjunction with a technology such as Docker. Later in this series we will look at how software-based application delivery approaches such as NGINX, which easily handles caching, access control, API metering, and monitoring at the microservice level, can help solve this problem. Building complex applications is inherently difficult. 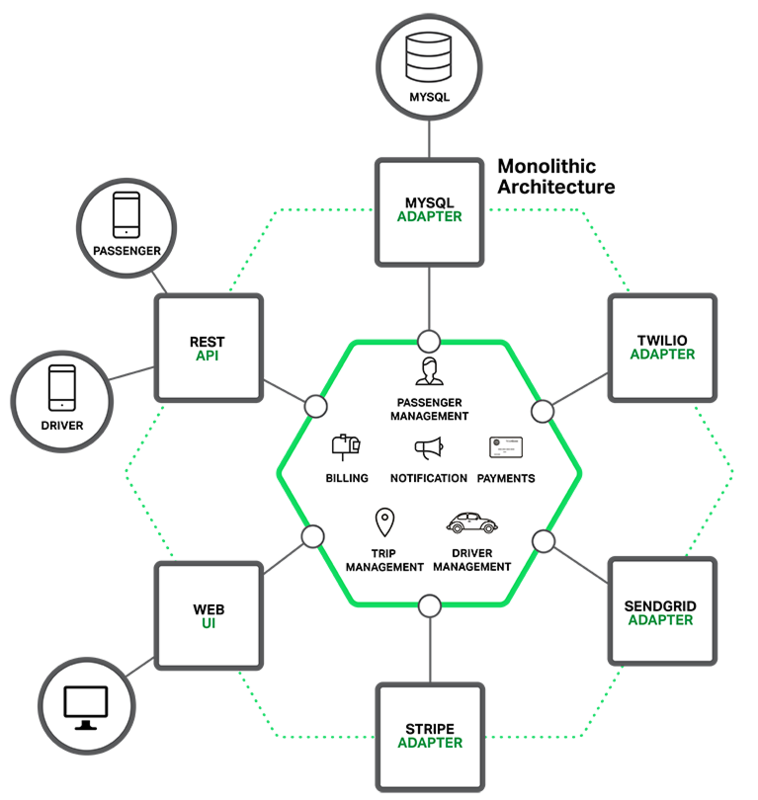 A Monolithic architecture only makes sense for simple, lightweight applications. You will end up in a world of pain if you use it for complex applications. The Microservice architecture pattern is the better choice for complex, evolving applications despite the drawbacks and implementation challenges. In later blog posts, I’ll dive into the details of various aspects of the Microservice architecture pattern and discuss topics such as service discovery, service deployment options, and strategies for refactoring a monolithic application into services.